Snow begins to drift when wind speeds reach about 10 mph. The wind scours snow from the windward side of terrain features such as ridges, open bowls and gullies. The snow is broken into smaller fragments and deposited on the on the downwind, or lee, side of the terrain features. The deposited snow can form thick, cohesive slabs. The stronger the wind the harder the Wind Slab. Wind Slabs form in specific areas depending on the wind speed and direction. They form on the lee aspects of ridgelines, cross-loaded gullies, or other terrain features. Areas around cliff bands and the lee side of krumholtz groves can also develop Wind Slabs. At stronger wind speeds, unusual loading/deposition patterns may occur. 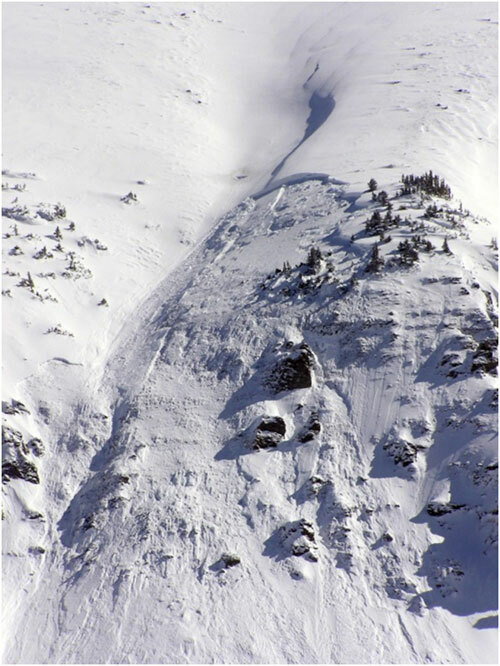 As wind speeds increase, the Wind Slabs may form further down slope than normally suspected, and may be found in small pockets in steep gullies or even down in the trees. Wind Slab avalanche. Winds blew from right to left across the picture, so the area right of the trees was scoured and snow was deposited to the left. Wind Slabs are most reactive during a wind event and the first day or two after it has ended. Wind Slabs can have a longer lifespan than Storm Slabs. During periods of very cold temperatures and extended wind events, Wind Slabs can persist for around a week. Wind slabs that form over a persistent weak layer like surface hoar, depth hoar, or near-surface facets may develop into Persistent Slabs. 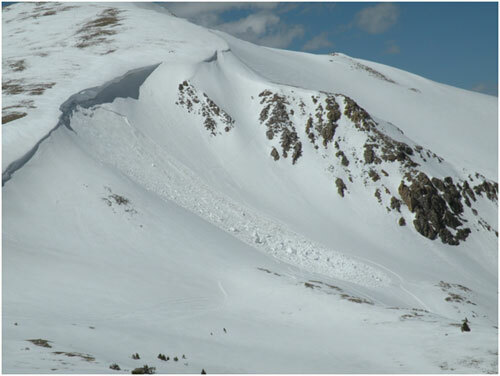 Look for convex pillows of wind-drifted snow on the lee side of ridges and other terrain features. The Wind Slab may have a chalky look and feel. Wind Slabs can be very hard, and may present a hollow drum like sound as you traverse across slope. Snowpack tests conducted in wind-loaded areas may reveal a Wind Slab problem in the upper few feet of the snowpack.